The information available on the sensitivity of soil biotic and abiotic attributes, which can be used to track the impact of reforestation in riparian buffers, is often insufficient to refine management practices and convince stakeholders of the benefits of reforestation. In this study, conducted in Victoria, Australia, the changes in soil biotic and abiotic attributes, organic carbon (OC), mineral nitrogen (MN), total dissolved solutes (TDS) and pH were characterised to assess the impact of land-use change from bare riparian (BR) to reforested riparian (RR). Additionally, the benefits of revegetating a deforested creek bank with regard to salinity abatement and C-sequestration potentials were assessed. The TDS depletion in the RR strips varied spatiotemporally from 65 to 169 mg/L, the net OC deposition from 16 to 19 g C/kg soil and MN deposition from 1.2 to 2.1 g N/kg soil, respectively. Additionally, the net changes in pH from alkaline to near neutral condition varied by 0.4 to 1.0 pH units. Approximately 30% to 60% of the net OC depletion after deforestation was redeposited under RR over 3 to 6 years. The TDS depletion after land-use changed from BR to RR ranged from 15 to 32% over 3 to 6 years. The soil attributes OC, MN and TDS characteristics under different land-use practices varied spatiotemporally. This information may be useful to convince stakeholders to undertake reforestation of creek banks for salinity abatement, and that change in land-use has the potential to increase C sequestration at a farm scale. Riparian buffer reforestation benefits include, but are not limited to, improvements in soil biotic and abiotic condition (Rasiah et al. 2015; An et al. 2012; Luo et al. 2010; Lal 2004; Rasiah et al. 2004; Silver et al. 2004), the quality of surface and subsurface water discharged into streams (Collins et al. 2012; Nair and Graetz 2004; Fennessy and Cronk 1997; Lowrance et al. 1984), retarding the progression of salinity via improvement in deep drainage, reduction in evaporation from the soil surface, thereby retarding solute transport to the soil surface from deeper within the profile (Clarke et al. 2002), providing shade for livestock (Lindenmayer et al. 2008), a potential for the return of native fauna and flora (Jose 2009; Lindenmayer et al. 2008; Hobbs and Norton 1996) and enhancing farm aesthetic values (Petursdottir et al. 2012). Furthermore, perennial reforested stands may serve as windbreaks, and sequester atmospheric CO2 in soil profiles (Jose 2009; Silver et al. 2004; Shepherd and Montagnini 2001). Recently, the farm-level benefits of reforestation along stream banks has been receiving increased attention, due in part to the potential for reduced sediment, nutrient and pesticide transport to streams (Kaleb et al. 2013; Wortley et al. 2013; Nair and Graetz 2004). How these are linked to soil biotic and abiotic attributes or whether they can be used to discriminate and characterise changes in land-use practices spatiotemporally is not well documented. Such information is essential to convince farmers, policy-decision makers and modellers to upscale their perspective from point measurements at a farm level, to landscape and catchment scales (Chen et al. 1999; Rasiah and Kay 1999). Changes in soil functioning depend partially on the dynamics of soil biotic and abiotic indicators, such as soil organic carbon (OC) (Tran et al. 2015; Rasiah and Kay 1998; Agren and Bosatta 1996), mineral nitrogen (MN) (Rasiah and Kay 1998), total dissolved solutes (TDS) and pH (Agren and Bosatta 1996). These functioning dynamics vary spatiotemporally (Rasiah and Kay 1999). Quantifying the dynamics of these indicators requires an appropriate baseline, which is usually obtained from undisturbed native vegetation in the vicinity of the degraded riparian strip. However, these are usually unavailable in landscapes used for large-scale commercial farming. Under such circumstances, the degraded riparian soil conditions may instead serve as the baseline against which to measure improvements in condition (Rasiah et al. 2015). The objectives of this study are to (i) characterise selected soil biotic and abiotic attributes, OC, MN, total dissolved solutes (TDS) and pH of soils that have been subjected to three contrasting land-use practices; (ii) assess the impact of reforestation of deforested creek-bank on salinity abatement and C-sequestration potentials; and (iii) explore the potential to convince stakeholders to manage riparian buffers appropriately in-order to sustain agroforestry on large farms in Victoria, Australia. 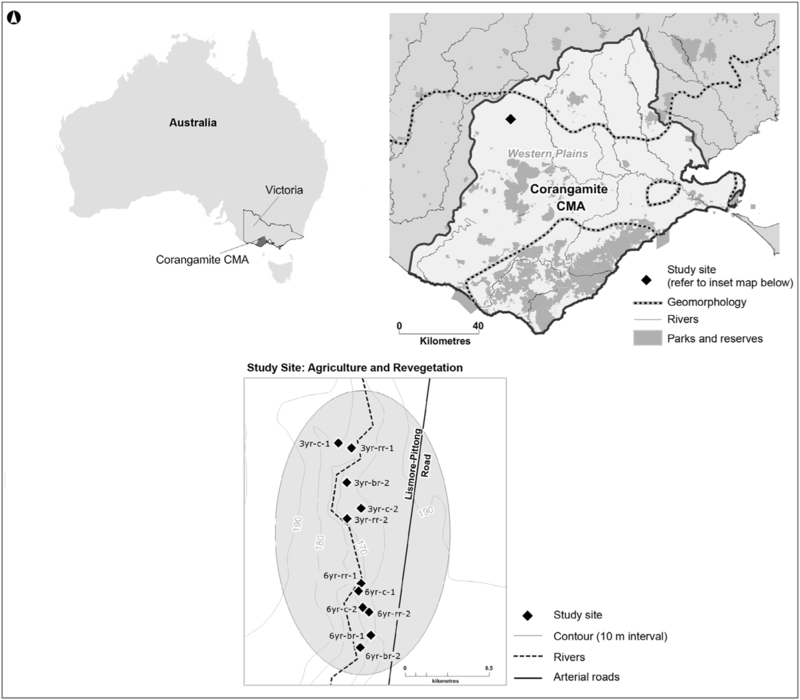 Soil samples were collected along four transects in the Corangamite Catchment in south-west Victoria, Australia (Fig. 1). The catchment is characterised by a temperate climate, having cool wet winters and warm to hot dry summers (Joyce 2003). The mean annual rainfall at the farm is ~ 600 mm, and land-use is mixed farming, including wheat and oil-seed crops rotated with pasture. The crops are generally sown in autumn (May–June) and harvested in late spring (September–October). No-till and low-till farming practices have replaced traditional ploughing over the past few decades, along with precision agriculture incorporating spatially variable fertiliser and herbicide applications, depending on specific crop requirements. The soil types at the farm are Sodosols that developed on weathered Quaternary volcanic rocks (Robinson et al. 2003; Gray et al. 2002; Nicholson 2002). They are texture contrast soils, typically varying in depth, dependent on the age of the parent material. The profiles are often shallow (< 2 m), base-rich clay loams over a strongly sodic heavy clay subsoil. The soils are generally of a low agricultural potential, characterised by high sodicity, erodibility, poor structure, low permeability and low to moderate fertility. Geologically, the soil profile characteristics are similar across the four transects and variability is likely associated with differences in micro-ecosystem functioning. Before these transects were cleared for cropping in the late nineteenth century, the land cover was native grassland, with native forest species (Acacia melanoxylon, Eucalyptus camaldulensis, Leptospermum lanigerum, Allocasuarina verticillata and Allocasuarina littoralis) along the riparian strip. Four transects, ranged in length from 150 to 200 m, and 50 to 100 m in width, and the separation distance between them ranged from 100 to 500 m (Fig. 1, Table 1). During design stage, two out of the four transects were selected as replicates for the 3-year and the remaining two for the 6-year reforestation land-use treatments. The cropland (CP) plot was on the upper aspect of a replicate/transect, and the corresponding bare riparian (BR) and the reforested riparian (RR) plots at the lower aspect, just above the bank of a seasonal creek. Before the study commenced the riparian strip was bare, apart from seasonal weedy vegetation. The RR plots were located 90 m to 165 m from the corresponding BR plots (Fig. 1, Table 1). The CP, BR and RR plots are considered to represent the different land-use and management practices that were investigated in this study. Native forest tree seedlings were planted in two of the four RR plots in 2006, and in two remaining plots in 2009. During soil sampling in February 2012, the seedlings were 6 and 3 years old, respectively. The 6-year-old RR plots are abbreviated as 6 yr-RR-1 and 6 yr-RR-2, the CP as 6 yr-CP-1 and 6 yr-CP-2 and the BR as 6 yr-BR-1 and 6 yr-BR-2. The 3-year-old RR plots are abbreviated as 3 yr-RR-1 and 3 yr-RR-2, CP as 3 yr-CP-1 and 3 yr-CP-2 and the BR as 3 yr-BR-1 and 3 yr-BR-2 (Table 1). Soil sampling was undertaken in February 2012. In each of the CP plots, a 25-m square was marked out. These were then divided into 25 grid nodes of 5 m × 5 m and each was allocated a number (1 to 25). To select the nodes for soil coring, five numbered cards were randomly drawn from a bag. At each of the selected grid nodes, five deep soil cores were extracted to 0.4 m depth using a 0.1-m-diameter hydraulically driven auger. Due to the impracticability of setting up 25-m square plots in the BR and RR plots, five soil cores were extracted at 5-m intervals along a 25 m strip within each plot. Three out of the five cores from each location were used for the determination of soil organic carbon (OC), mineral nitrogen (TN), total dissolved solutes (TDS) and pH, while the other two cores were reserved for another study. Each one of the three cores was segmented at 0.1 m depth increments. Large clods were broken down to smaller pieces. The resultant material was air-dried in the laboratory and sieved through a 2 mm sieve. The sieved material was used for the determination of OC, MN, TDS and pH, using the procedures described by Rayment and Higgins (1992) at a NATA (National Association of Testing Authorities (Australia)) accredited laboratory. To determine the statistical significance of the data, mean separation analysis and simple linear correlations were performed using the Statgraphics Centrion XVI (2010) package. Initially, we considered that two transects out of the four as replicates for the 6-year-old reforested (RR) land-use treatment and the corresponding cropland (CP) and bare riparian (BR) land-uses. The other two transects for the 3 years of RR stand, and the corresponding CP and BR land-uses. A mean separation analysis was conducted to determine whether the depth incremented soil attributes organic matter (OC) and mineral nitrogen (MN), electrical conductivity (EC) and pH were sufficiently sensitive to characterise and discriminate the land-use practice. The depth incremented means and the corresponding pools for a given attribute (e.g. OC or EC) showed that the two replicates belonging to a given RR time-frame were statistically not replicates; therefore, we consider the replicates as different sites in the farm. This is where spatial variability or site-specificity concept came into play in this paper. In Tables 3 and 5, we show the functional relationship between the soil attributes by defining OC = f (MN or EC or pH), MN = f (EC or pH) and EC = f(pH), to determine whether the land use practice and/or site-specific variability between replicates had any impact on the functional variability of the attributes. For the OC correlation, the 16 means from the 4 CP plots (Table 2) were correlated with the corresponding TN or EC or pH (Table 4), and similarly for TN, EC and pH. For these correlations, the depth increment was considered as selection variable. Correlations were also conducted to verify whether soil attributes (OC, MN, EC and pH) interacted with each other, and if there was any interaction among the three land-use practices. The OC content in any given profile section in the CP plot was generally higher than that in the corresponding RR, regardless of the number of years after reforestation, followed by BR. The mean OC-pools between replicates 1 and 2 or that between replicates 3 and 4 were significantly different from each other. Similar results were also obtained for that between the MN-pools or TDS-pools of replicates 1 and 2 and between replicates 3 and 4 (later in the text). The OC-distributions across all CP plots ranged from 44.0 to 13.40 g C/kg soil, 34.8 to 11.0 g C/kg soil in the RR plots and 28.4 to 10.3 g C/kg soil in the BR plots, respectively (Table. 2). The mean OC content in the CP, RR and BR plots were 107.8 g C/kg soil, 80.0 g C kg/soil and 69.6 g C/kg soil, respectively. The OC-pools across the CP plots ranged from 91 to 131 g C/kg soil compared with 61.8 g to 88.9 g C/kg soil for RR and 64.8 to 73.7 g C/kg soil for BR (Table 2). This trend prompted us to claim that a given replicate was independent of the other three with regard to the soil attributes and proceeded to use it as a characteristics property for a given land-use along a given transect, implying the means are site-specific property for that land-use (Tables 2 and 4). The OC content in any given profile section of CP plot in replicate 1 was significantly different from the corresponding section in RR, which in turn varied from BR (Table 2). This implies the depth incremented OC-distributions among the three land-use practices in replicate 1 were significantly different from each other (Table 2). Similar results were also obtained for replicates 2, 3 and 4. These significant differences between OC-distributions of the three land-use practices indicate that mean separation analysis is useful to discriminate the impact of land-use practice on soil OC content along a transect. The OC-pools also showed significant differences between the three land-use practices. The OC contents in three out of the four sections of the soil profile under the 6-year-old RR plot in replicate 1 were significantly different from the corresponding sections in the RR of replicate 2 (Table 2). We define this as that 75% of the OC-distributions between the 6-year treatment replicates were significantly different from each other. The significant difference between the OC-distributions of the CP plots in replicate 1 and 2 was 100%, and also 100% between the BR plots. The OC-distributions between the RR plots in replicates 3 and 4 were 100% significantly different, and the corresponding significant difference between the CP plots was 50%. The OC-pools among the four RR replicates were 100% significantly different from each other, and similar results were obtained for the CP and BR replicates. The net OC deposition (difference between the OC-pools of RR and BR) 3 years after reforestation in replicate 4 was 15.0 g C/kg soil, compared with 15.7 g/kg soil and 18.5 g C/kg soil 6 years after reforestation in replicates 1 and 2, respectively. The net OC depletion (OC-pools of CP minus BR) in the deforested BR plot in replicate 4 was 35.8 g C/kg soil, compared with 26.2 g C/kg soil in replicate 1 and 61.0 g C/kg soil in replicate 2, respectively. The absolute values of the slopes of the correlations indicate that OC content decreased with increasing depth, regardless of the land-use practices in the replicate/transect (Table 3). The slopes were significantly different among land-use practices, being highest for the CP, followed by RR and BR, respectively, suggesting that C turnover dynamics with soil depth depended on the land-use practice. The intercepts followed trends qualitatively similar to the slopes, in that they decreased with increasing depth and varied between land-use practices. The mineral nitrogen (MN)-distributions across the CP plots ranged from 1.07 to 3.96 g N/kg soil, 0.70 to 3.08 g N/kg soil in RR and 0.87 to 2.50 g N/kg soil in BR, respectively (Table 2). The mean MN content in the CP, RR and BR plots were 2.29 g N/kg soil, 1.75 g N kg/soil and 1.54 g N/kg soil, respectively. The MN-pools across the CP plots ranged from 8.15 to 10.62 g N/kg soil, compared with 6.95 to 8.57 g N/kg soil for RR and 5.76 to 6.50 g N/kg soil for BR land-uses (Table 2). The MN content in any given profile section in the CP plot was generally higher than that in the corresponding RR, regardless of the number of years after reforestation, followed by BR. The mean MN content in any given profile section of replicate 1 was significantly different from the corresponding section in replicate 2, regardless of the land-use practice, and similar results were obtained for that between replicates 3 and 4. The MN-distributions among the three land-use practices on replicates 2, 3 and 4 were 100% significantly different from each other, except in replicate 1. The MN-pools among the three land-use practices were 100% significantly different from each other on each one of the replicates 1, 2 and 3, except 66% in replicate 4. Neither the MN-distributions nor the MN-pools in all four replicates showed 100% significant differences among the three land-use practices. The significant differences between the MN-distributions of the 6-year-old RR replicates, and the corresponding BR and CP replicates, were 100%, 75% and 100%, respectively. The MN-distributions between the 3-year-old RR replicates were 100% significantly different and a similar result was obtained for the corresponding CP replicates. The MN-pools between the replicates were 100% significantly different from each other. The MN-pools were generally able to discriminate the impacts of land-use practices and site-specific characteristics differences between transects/replicates on MN content in soil profiles. The magnitudes of the slopes of the correlations indicate that MN-distributions decreased with increasing depth, regardless of the land-use practices in the replicates/transects (Table 3). The slopes were significantly different among the three land-use practices, being highest for CP followed by RR and BR, respectively, for the 3-year-old RR replicates. Even though a similar trend was observed for the 6-year-old RR in replicates 1 and 2, the slopes for the CP and RR are not significantly different from each other. The intercepts followed trends similar to the slopes, being highest for CP followed by RR and BR. The net MN deposition (which is the difference between the MN-pools of RR and BR) in the 3-year-old stands of RR in replicate 4 was 2.07 g N/kg soil, compared with 1.19 g N/kg soil and 1.22 g N/kg soil under the 6-year-old RR stands in replicate 1 and replicate 2, respectively. The net MN depletion (MN-pools of CP minus BR) in the deforested BR plot in replicate 4 was 2.02 g N/kg soil, compared with 2.68 g N/kg soil in replicate 1 and 4.42 g N/kg soil in replicate 2, respectively. The significant difference between the electrical conductivity distributions (EC-distributions) of the 6-year-old RR replicates was 100%, and that between the corresponding BR replicates and CP replicates were 75% and 50%, respectively (Table 4). The significant difference between the 3-year-old RR replicates’ electrical conductivity (EC)-distributions was 100% and 25% for that between the corresponding CP replicates. The TDS-pools between the 6-year-old RR replicates were significantly different from each other, as it was between BR replicates, but not between the CP replicates. The TDS-pools between the 3-year-old RR replicates were significantly different from each other, as it was between the corresponding CP replicates. The EC in a given profile section was generally higher in BR plots, followed by RR and CP, respectively (Table 4). The TDS-pools across the CP plots ranged from 291 to 329 mg/L, compared with 175 to 452 mg/L for RR plots, and 435 to 621 mg/L for the BR plots. After the land-use changed from BR to RR, the average TDS decreased by ~ 36%. Even though there was a general trend for the EC to decrease with increasing soil depth, the correlations were significant only for the CP plots (Table 3). The TDS depletion that occurred 3 years after reforestation in the 3 yr-RR-2 stand was 169 mg/L, compared with 182 mg/L and 65 mg/L in the 6 yr-RR-1 and 6 yr-RR-2 stands, respectively. Compared with the BR land-use practice, the CP land-use practice retarded the TDS depletion by ~ 309 mg/L in the 3 yr-CP-2 plot, compared with 251 mg/L and 106 mg/L in the 6 yr-CP-1 and 6 yr-CP-2 stands, respectively. Neither EC-distributions nor TDS-pools were found to be effective discriminators to characterise the site-specific impact of long-term CP land-use. On the other-hand, both indicators were effective to discriminate the site-specific impact of the change in land-use practice from BR to RR. The depth incremented pH distributions between the 6-year-old RR replicates was 100% significantly different, and that of the corresponding BR and CP replicates were 75% and 50%, respectively. The significant difference between the 3-year-old RR replicates was 100% and 25% for the corresponding CP replicates. The distributions indicate that pH was generally higher, i.e. in the alkaline range, in the BR plots, in contrast to the RR, which were near neutral to slightly acidic, and CP, which were generally slightly acidic, except in the 3 yr-BR-2 plot where it was lower than the corresponding RR plot. The distributions suggest a general increase in pH with increasing depth, but the correlation analysis shows this as insignificant increase. Six years after reforestation, the pH in the RR plots was less than the corresponding BR plots, but this was not explicit 3 years after reforestation. The significant differences (BR > RR > CP) that were observed between the land-use practices at a given site indicate treatment impact. The pH distributions were a very effective indicator to discriminate site-specific impact of land-use change from BR to RR. It was also useful to discriminate between BR and CP land-uses. The CP and BR plots have been under the cropping and bare, respectively, land-use practices for more than 50 years. Under these conditions, we suggest the distributions of OC, MN, EC and pH and the pools in the top 0.40 m depth might not have undergone any significant change during the relatively short study period of 3 to 6 years. Because of this, the major emphasis in this paper is on the changes from BR land-use to RR. Therefore, we considered BR as the background or control for this study (Rasiah et al. 2015). This proposal implies that any significant difference between the OC or MN or EC or pH distributions in the BR replicates is primarily due to site-specific impact on these attributes. The significant difference between the OC-, MN-, EC- and pH distributions in the 6-year-old BR replicates were 50%, 75%, 75% and 75%, respectively (Tables 2 and 4). On the other hand, the significant difference between the pools of OC-, MN- and EC- of the BR replicates were 100% for each of them. Therefore, the pools of the attributes are better than the corresponding distributions to characterise the appropriateness of design stage replicate assumptions vs. the statistical validity of the replicates. The means separation analysis indicates the design stage replicate assumption is not valid, therefore we decided to proceeded with the statistical validity and consider the replicates as four independent transects, and the soil attributes characteristics along any given transect is site-specific. Even though the validity of the experimental results without replicates may be an issue, but site-specificity impact on soil attributes is what the reality in large-scale experimental approach in which the typical experimental designs are difficult to apply. On the other hand, the results are very useful for up-scaling via modelling for situations where site-specific experimental soil characteristics approximate the new site/farm and also may help to convince the stakeholders the impact of site-specific soil attributes variability on spatially varying reforestation issues. The distributions of OC, MN, EC or pH between the RR replicates generally produced 100% significant difference and as did the corresponding pools. It seems the pools for attributes can be generally used to assess the impact of the land-use change from BR to RR. Significantly higher average net organic matter (OC) deposition (17.1 vs. 15.0 g C/kg soil) was observed in the older RR stands compared to the younger (6 vs. 3 years), as was the case for the net TDS depletion (245.7 vs. 169.0 mg/L, 3 vs. 6 years). This implies that these two soil attributes can be used as indicators to characterise temporal impact of reforestation. However, the same possibility was not evident with regard to net mineral nitrogen (MN) deposition. Comparisons of the OC-distributions between each RR and its corresponding BR profiles indicate that C deposition has occurred down to 0.4 m depth in all of the four RR profiles, regardless of the temporal or site-specific impact (Table 2). This implies that when reforestation is undertaken using deep-rooted trees, the depth to OC deposition should be given due consideration, in order to provide the most reliable information for atmospheric C-trapping benefits of reforestation. In this context, the slopes and intercepts of the correlations can be extrapolated to compute the maximum depth to which OC and MN depositions ceased to occur under RR. The extrapolations indicate the maximum depths to OC and MN depositions to occur under the 3-year-old RR stands are 0.53 m and 0.57 m, respectively, and 0.56 m and 0.48 m under the 6-year RR stands. The average net OC deposition (the difference between the OC totals of RR and the corresponding BR) that occurred 6 years after commencement of reforestation was 17.1 g C/kg soil and the corresponding net OC depletion (the difference between the OC totals of CP and the corresponding BR) was 43.6 g C/kg soil. These quantities translate to ~ 39% of the depleted OC redeposited by the forest stand. The average MN depletion and the corresponding depositions were 3.55 g N/kg soil and 1.21 g N/kg soil, respectively, and these translate to ~ 35% of the depleted MN being redeposited. The average TDS depletion (difference between BR and RR) 6 years after reforestation was 123.8 mg/L and this translates to ~ 12% of what was in the BR profiles. The net OC depletion that occurred after deforestation (> 50 years ago) in the 3 yr-BR-2 plot was 35.8 g C/kg soil compared with 26.2 g C/kg soil and 61.5 g C/kg soil in the 6 yr-BR-1 and 6 yr-BR-2 plots, respectively, indicating site-specific soil biotic functioning variability impact between the sites can be characterised by net OC depletion under BR. The average net OC depletion after forest clearing was ~ 41.2 g C/kg soil. The net OC-depletion of ~ 35.8 g C/kg soil extrapolates to ~ 212.7 Mg C/ha. It seems ~ 30% (net OC deposition divided by net OC depletion) of the depletion that occurred in the 6 yr-BR-2 plot had been restored during 6 years under the reforested stand compared with ~ 60% in the 6 yr-RR-1. Results from other parts of Australia indicate similar depletions occurred after clearance of native vegetation (Cotching 2012). The OC-depletions that occurred after vegetation clearance have been linked to deteriorations in soil bio-physical-chemical condition (Luo et al. 2010; Lal 1981). Larger OC-pools under RR than BR implies reduction in the CO2 released to the atmosphere (Smith 2008; IPPC 2001). The slopes of the correlations (Table 3) between OC- and MN-distributions and profile depth indicate the decrease was most rapid under CP, followed by RR and BR, respectively, suggesting there were three different micro-ecosystem, soil biotic conditions, with regard to OC turnover dynamics along the transect. The net MN deposition of 2.07 g N/kg that occurred 3 years after reforestation commenced, compared with 1.19 g N/kg soil in 6 yr-RR-1 and 1.24 g N/kg soil in 6 yr-RR-2, suggest the longer temporal influence at the latter two sites was probably masked by the unfavourable site-specific conditions overriding the temporal influence. Significant TN deposition seems to have occurred down to 0.4 m depth in 3 yr-RR-2 and 6 yr-RR-2 plots compared with 0.2 m in the 6 yr-RR-1 plot. Even though deposition had occurred down to 0.4 m in 3 yr-RR-2 and 6 yr-RR-2 plots, it was higher in the former, 2.07 g/kg, than the latter, 1.24 g/kg, suggesting the temporal influence in the latter was overridden by unfavourable site-specific soil biotic impact. Higher electrical conductivity (EC)-distributions in BR than RR (Table 4) suggests solute washout from 0.4 m depth under RR after reforestation. This was probably due to (i) enhanced deep percolation through the root-channels opened-up by a deep-rooted forest stand, (ii) increases in root-water uptake from deeper sections of profiles instead of being transported upwards, along with solutes, to the soil surface and (iii) decreases in soil evaporation that otherwise was driving upward solute transport. The major proportion of solutes in Victorian sodosols are saline and these are known to have been transported towards the soil surface after native vegetation clearance (Robinson et al. 2003; Nicholson 2002), leading to a risk of dry-land salinity. The reforestation results from this study indicate that even a short time-frame (3 years) under reforestation was effective in combating salinity risk. The reforested stand could also help to reduce surface runoff, thereby reducing pesticides, herbicides and unused fertiliser (N and P) solutes loadings in streams, which may in turn be discharging into sensitive off-site water bodies. Such improvements may help in the return and re-establishment of the fauna and flora that disappeared after deforestation (Petursdottir et al. 2012). A net-depletion of 169 mg/L in 3 yr-RR-2 compared with 182 mg/L in 6 yr-RR-1 indicates temporal influence on solute wash-down/depletion in the latter. However, a similar comparison between 3 yr-RR-2 and 6 yr-RR-2 (169 vs. 65.3 mg/L) was observed, suggesting a reverse trend due to unfavourable site-specific soil abiotic conditions that prevailed at the latter site for salt washout, thereby overriding longer temporal influence there. Larger TDS-pools under BR than CP may be due to bare surface conditions in BR provided a more favourable situation for soil water evaporation than crop/pasture cover, thereby enabling relatively greater upward transport of solutes. The difference between the TDS-pools of 6 yr-BR-1 and 6 yr-CP-1 (251 mg/L) and 6 yr-BR-2 and 6 yr-CP-2 (106 m/L) may be due to differences in site-specific subsurface variability influencing variation of evaporation rates or amounts between the sites. Salt washout after reforestation suggests forest stands along fence lines, riparian buffers and any other unused marginal lands on large farms may help to reduce salinity risk at a farm level. The significant differences between pH distributions of the BR plots indicate site-specific subsurface soil variability, resulting variation of soil acidity/alkalinity between the sites. This suggests the pH in BR can be used as a baseline to assess the impact of reforestation. The decreases in pH, from alkaline to near neutral or mildly acidic, suggests that alkaline solute-washout has occurred as a result of reforestation. In Australia, this process is considered a positive change, since it reduces salinity risk following native vegetation clearance (Clarke et al. 2002; van der Moezel and Bell 1992). The change from alkaline to near neutral to slightly acidic condition after reforestation of BR may help to retard, to a limited extent, salinisation. This should encourage farmers to undertake stream bank reforestation as a management option to combat salinity in similar situations. Even though soil acidity is a major issue under dry-land cropping in Australia, the mildly acidic condition under CP are not yet an issue at this farm. Other workers (Kaleb et al. 2013; Wortley et al. 2013; Collins et al. 2012; Fennessy and Cronk 1997) have reported that reforestation and associated forest litter may help to reduce agricultural pollutants, such as soluble N and P, sediment and pesticides, in surface runoff from croplands, thereby improving the water quality of runoff, and consequently improving water quality downstream. The higher MN concentrations observed in RR than BR might have been due to reduced surface runoff. Vertical transport of solutes, including MN, in soil infiltrating water may have resulted in the observed increase of the MN-pools in the RR profiles. Decreases in bulk density after reforestation and the deep root-channels opened-up under RR might have provided conditions favourable for deep percolation into soil profiles (Rasiah et al. 2015). The anticipated improvements in creek water quality may help to improve the on- and off-site aquatic ecosystem health, in addition to other environmental benefits (Montaggnini 2006). It is not surprising that OC was positively correlated with MN, regardless of the land management practices examined in this study. However, we anticipated similar trends for RR. Nevertheless, the negative correlation between OC and pH under CP is consistent with the expectation that when soil pH changed from alkaline to near neutral, the OC turnover dynamics improved and a similar change was anticipated with EC. The positive correlation between OC and EC implied that when TDS increases, the OC turnover dynamic responds likewise. However, this trend is unrealistic (Table 5). A positive correlation between EC and pH suggests a trend between OC and EC. The interactions involving the abiotic indicators indicate that they can have significant impact on OC and MN accumulation in the reforested landscape, thereby improving the soil abiotic condition. Even though the depth-incremented distributions of soil organic carbon (OC), soil mineral nitrogen (MN), total dissolved solutes (TDS) and pH were not sufficiently sensitive to discriminate changes in land-use management practices from native forest to cropland (CP) or bare riparian (BR) and then from BR to reforested riparian (RR), the OC-, MN- and TDS-pools were effective as sensitive indicators to discriminate changes in land-use. However, the pools were not consistently sensitive enough to differentiate the temporal impact of reforestation on the changes in soil condition. The net-deposition of OC and the net-depletion of TDS were found to be sufficiently sensitive to differentiate site-specific and temporal impacts of reforestation. However, there was also a potential for the temporal impact of reforestation on the soil attributes to be overridden by site-specific variability. To differentiate deforestation or reforestation associated changes in soil biotic condition, we therefore recommend the determination of TDS wherever salinity is a major issue, and OC where C-credit at farm scale is considered as an incentive for C-sequestration in soil. The determination of both OC and TDS are recommended where C-credit is considered as an incentive and salinity a major issue. In BR land-use, pH distributions provided a sufficiently sensitive baseline to discriminate site-specific subsurface soil conditions between the sites. This suggests that pH in BR can be used as an indicator to assess the impact of reforestation on pH dynamics in reforestation. The interaction involving OC, EC and TDS indicate the need for further research into how other abiotic indicators may interact positively and contribute towards improvement in soil biotic condition. Such information may help us to increase the ability to refine and improve the C-sequestration potential of windbreaks associated with whole farm operations. This study was funded through the Corangamite Catchment Management Authority (CO0910.06.051). The authors thank the landholders for site access and the Victorian Department of Primary Industries for discussions and analyses. Financial support for this project was provided by the Corangamite Catchment Management Authority (Funding number CO0910.06.051). SF received the funding, VR and SF conceived and designed the data collection. VR wrote the MS. VR and SF edited the MS. Both authors have read and approved the final manuscript.